Spirit Rover Finds Magnesium Sulfate Near “Larry’s Lookout” in Columbia Hills on Mars. March 26, 2005 Albuquerque, New Mexico - Earthfiles is staying in touch with Larry Crumpler, Ph. D., Mars Spirit Rover Mission and Research Curator, who receives data from Spirit and designs maps based on rover data. Dr. Crumpler is based in the Volcanology and Space Science Department at the New Mexico Museum of Natural History and Science in Albuquerque, New Mexico. He is the scientist after whom "Larry's Lookout" was named in the Gusev Crater's Columbia Hills. This week he emailed me twice about Spirit's long trek across the Columbia Hills and included the stunning image of Martian soil rich in magnesium sulfate. No question that Mars was wetter when the Columbia Hills rocks were deposited before the Martian climate suddenly changed very early in the red planet's history to greater dryness. See more information in Earthfiles 022505. 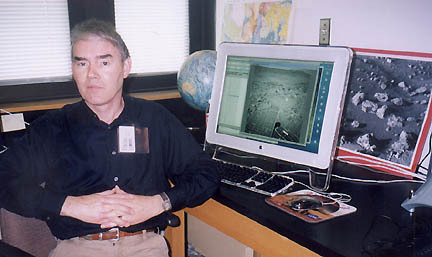 Larry Crumpler, Ph.D., Planetary Scientist and member of NASA Mars Spirit Rover team. Dr. Crumpler is also Research Curator for Volcanology and Space Science at the New Mexico Museum of Natural History and Science in Albuquerque, New Mexico. Photograph © 2005 by Linda Moulton Howe.